I’m just going to come out and say it: I love mayonnaise. I use mayonnaise to marinate vegetables for grilled salads, put mayo in and on crab cakes and shrimp burgers, and smear it generously on white bread for tomato sandwiches. My favorite coleslaws and potato salads are mayo-based, and I’ll take mayo over ketchup any day for French fries. My kids share my love: their favorite turkey sandwiches must have mayonnaise. They consider it just as important as the turkey or bread. 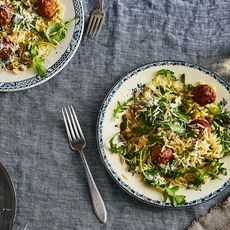 I now have another favorite mayonnaise use: making these tender turkey meatballs and orzo with whole-lemon vinaigrette. Mayo is certainly not a traditional ingredient in meatballs. But it’s not an unusual choice, either, when you consider its parts: egg, oil, and a small amount of vinegar or lemon juice, all whisked or blended together. Because it’s a stable emulsion, mayo serves as an excellent binder for meatballs. It easily slips into the role played by eggs and bread crumbs. With mayo, the path to meatballs is simple: no eggs to crack, no bread to blitz into fine crumbs, no guessing at the amount of crumbs to work in (too much...hockey puck meatballs! Too little...crumbly, fall-apart meatballs!). And a good quality mayo adds a lot of flavor in the process. For these turkey meatballs, I use Sir Kensington’s classic mayo with sunflower oil, which has a lovely lemony flavor. The rest of the ingredients fall in place: lemon zest to reinforce the lemon flavor of the mayo; garlic, parmesan, and fresh parsley to brighten. Easier still, these meatballs are cooked on a sheet pan under the broiler, so they get golden brown without the mess and time required of frying. 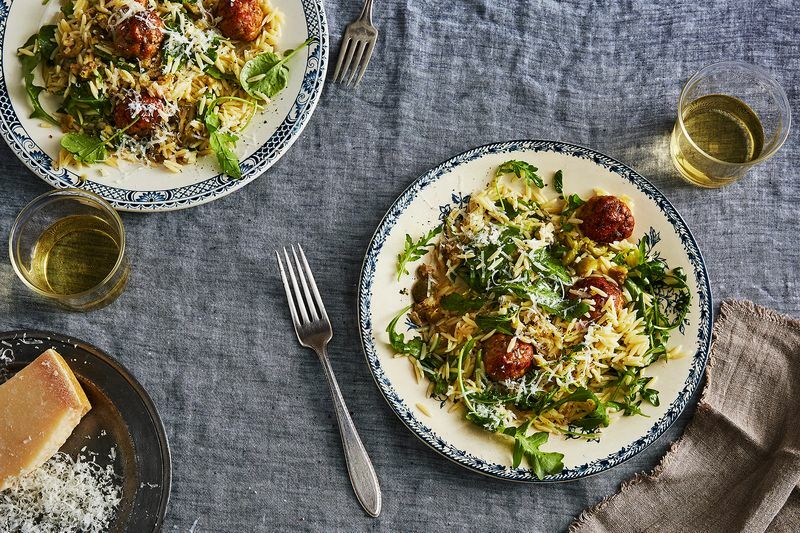 Together, the meatballs and orzo are bright, light, and lemony, the perfect antidote to dwindling daylight hours and falling temperatures. Change up the meatballs: ground chicken or pork can stand in for turkey, pecorino for parmesan, and chopped basil for parsley. Bake them (versus broil) for about 25 minutes at 425° F.
Do a Greek take on the orzo salad by swapping out kalamata olives for the Castelvatrano in the whole-lemon vinaigrette, then mixing in a big handful of chopped dill and some crumbled feta with the orzo, inspired by this lemon-dill orzo pasta salad. Serve the meatballs with spaghetti and your favorite marinara sauce for a more traditional take. The lemony meatballs go well with marinara, in much the same way that a fine grating of lemon zest brightens marinara (see Kristen’s genius tip here). Ditch the pasta! Slice the meatballs and use them as a pizza topping, or tuck them into a roll for a meatball sub. 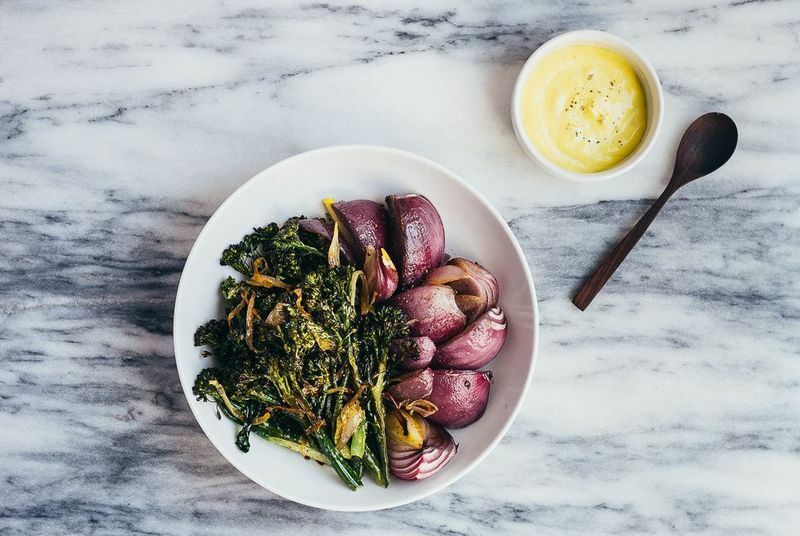 This article was written by EmilyC from Food52 and was legally licensed through the NewsCred publisher network. Please direct all licensing questions to legal@newscred.com. Cozy up to these comforting meatball recipes. Smothered in sauce, loaded with herbs and served over your favorite pasta, meatballs are a must on the dinner menu rotation. Three of our favorite recipes: Herbed Turkey Meatballs, Easy Swedish Meatballs and The Ultimate Meatball.